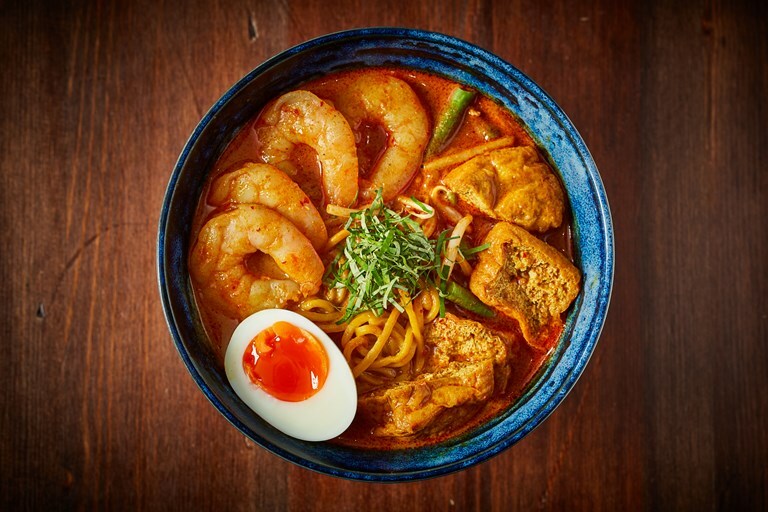 This is the curry laksa that made Mandy Yin's Sambal Shiok one of the hottest tickets in London. As far as comfort food goes, it ticks all the boxes – it's warm, rich and hearty with a good kick of chilli and a healthy helping of noodles, prawns, tofu puffs and beans. Making your own chicken broth will really boost the flavour of the final dish, but the foundation is the laksa paste. We recommend making a big batch and then freezing in portions – you never know when you might come home to a laksa craving. This is my curry laksa, with a strong chilli and shrimp kick. We tend to save cooking laksa for special occasions due to its time-consuming method and many ingredients, especially if cooking the chicken stock from scratch. If you can find them, laksa leaves (also known as rau ram or hot mint (Polygonum Odoratum)) adds a distinctive fragrance to the dish and takes me back to my childhood growing up in a Nyonya household. Like any good curry, the broth develops in flavour if left overnight. Top the noodles with the beansprouts, green beans and prawns, then pour the hot laksa broth into each of the bowls with 4 halved tofu puffs per serving. Finish with a pinch of the shredded hot mint on top and half a soft-boiled egg.